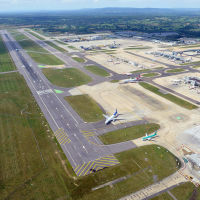 UK holiday-goers and business exporters alike require urgent action on South East England airport expansion, according to a new report. Let Britain Fly (LBF) commissioned a KPMG study, which it says shows the need for a quick decision on the expansion's location is even more necessary following Britain's exit from the EU. The campaign group says that 128 of the planet's biggest cities - those with over 2 million inhabitants - are currently unconnected to London airports, with this number set to swell to 205 by 2030. It says it is vital that UK businesses are not isolated in the wake of the Brexit vote, so they can expand on trade in non-EU countries. The UK will be restricted in linking to any of these major cities if airport expansion is not swiftly sanctioned, the research warns. As many as 31 of the 77 further cities breaking the 2 million-plus population barrier by the end of the next decade will either be in India or China, both growing markets. James Stamp, KPMG's worldwide aviation head says British industry has never more needed to show its desire and capacity to link to its trading investors and partners. He says that quickly identifying and seeing through an expansion project would send a message to the rest of the globe. LBF director Gavin Hayes says that unlocking access to non-EU markets will not happen if a new runway remains unbuilt. What's happening with the decision? New Transport Minister Chris Grayling has intimated that no decision will be forthcoming from Prime Minister Theresa May's new government until at least October. Campaigners had hoped that the then PM David Cameron would have announced whether Gatwick or Heathrow had won the new runway before last month's Brexit vote. But his departure following the "Leave" vote has further delayed the process. Clued-up businesspeople flying overseas know the prudence of sorting out one piece of personal business before they set off. Taking out trusted travel insurance can prevent them being left out of pocket should the worst happen. It protects against delayed or cancelled flights, l ost possessions , stolen luggage and mislaid travel documents.